An interesting thing happens when setting and character come together, something writers don’t fully realize, or if they do, may not use to its full advantage: combined with intent, these two elements produce emotion. What do I mean by that? Well, think about us in the real world. Are there places you choose to vacation again and again? Is there a specific route you like to walk the dog, or areas in the city you enjoy visiting? Do you have a favorite restaurant, room in the house, coffeeshop, or park to sit in? I’m betting you do. Spaces we return to are special in some way, causing us to experience positive emotions. We may enjoy them for their beautiful scenery, their energy or solitude, because they remind us of the comforts of home, or some other meaningful reason. Just as we gravitate to places that make us feel good or safe, we also make emotional decisions about locations to avoid: that dark ally shortcut, the friend’s car that smells like spoiled milk, the high school football field where we were humiliated in front of the entire senior class. These spaces make us feel unsafe, vulnerable, or unhappy. Our characters are just like us, so they will also have a catalog of places that hold personal meaning, good and bad. The difference between the real world and the fictional one? 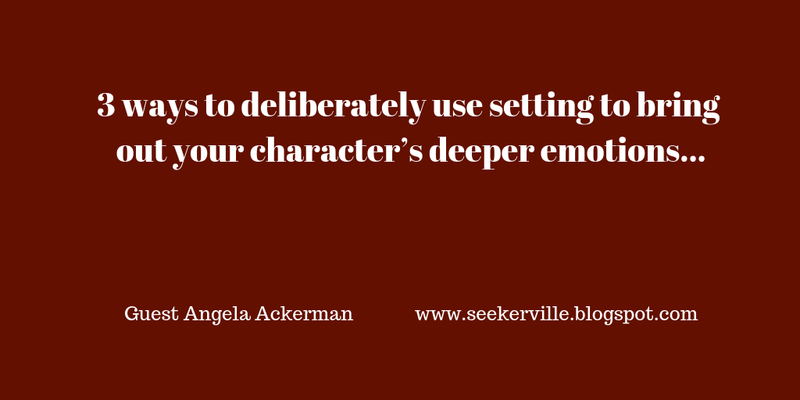 Rather than shield our characters from uncomfortable emotions, we want to encourage them. I know, it sounds a bit sadistic but exposing them to settings that trigger a range of emotions, some of which they desperately want to avoid, will not only produce conflict (a necessary ingredient in story), it will help to reveal their hidden layers. Beneath the surface of any character is a dark underside: insecurities, fears, and pain caused by negative past experiences and unresolved emotional trauma. This baggage is costly to lug around, causing unhappiness and steering the character’s life off course. This is usually how readers find them at the start of a story: incomplete, adrift, and hurting. And, if the writer has chosen a change arc for the character, it’s even more important to pull this pain to the surface where it can finally be acknowledged and dealt with. Only then can the character move forward toward happiness and hope, fulfilling the change arc and achieving their goal. Positive and negative, emotions are the lifeblood of a story. The setting we choose for each scene is a vehicle to bring out a wider range of emotions, including those that provide a window for readers to see inside the character and the struggle going on within. 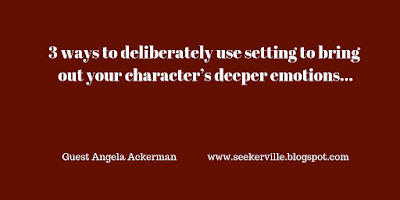 Here are three ways you can deliberately use the setting to bring out your character’s deeper emotions. With each scene, think about the actions that will unfold and what each character’s emotional state will be. If you can, find a setting location that will amplify these emotions, perhaps by choosing one that holds personal meaning (good or bad). For example, what location would be a better choice for revealing a parent’s betrayal to her adult son: in the car on the way to the airport at the end of a visit, or at the playground where the character and his mother would come every day after school? The setting itself can trigger powerful emotions in the right circumstance. If your character is under so much pressure they’re struggling to function or they are on their final frayed nerve, use the setting to plant a natural obstacle in their path (a nosy security guard, a locked door, a car that dies halfway to their destination) that pushes them past their limits to cope. This new difficulty will trigger powerful, raw emotions whether they break under the strain, or find inner strength to prevail. When it comes to the painful past, characters want it to stay there: in the past. So instead, we writers should dig around in that old suitcase of pain and resurrect a ghost: a person, thing, situation, or experience that will act as an echo of that past trauma. It might be a setting itself, or something that can be inserted into the setting. Maybe the character’s alcoholic dad shows up unannounced to her child’s graduation party at a restaurant, or a couple planning a honeymoon trip arrive at their appointment to discover the travel agent is a bitter ex-girlfriend. Perhaps the character is ill and is forced to pull into a roadside stop, a place she normally avoids at all costs as she was carjacked at one once. What does the character feel in this moment? What will they do? Choose settings and setting elements specifically to awaken complicated emotions and possibly force them to deal with something from the past. Becca and I love to think about how we can push description to work harder in our stories. The possibilities are endless, so we encourage you to always think deeper, combining elements and experimenting with ways to increase tension, personalize story moments, and especially to deepen emotion. If you ever need help, visit our website or check out our books. 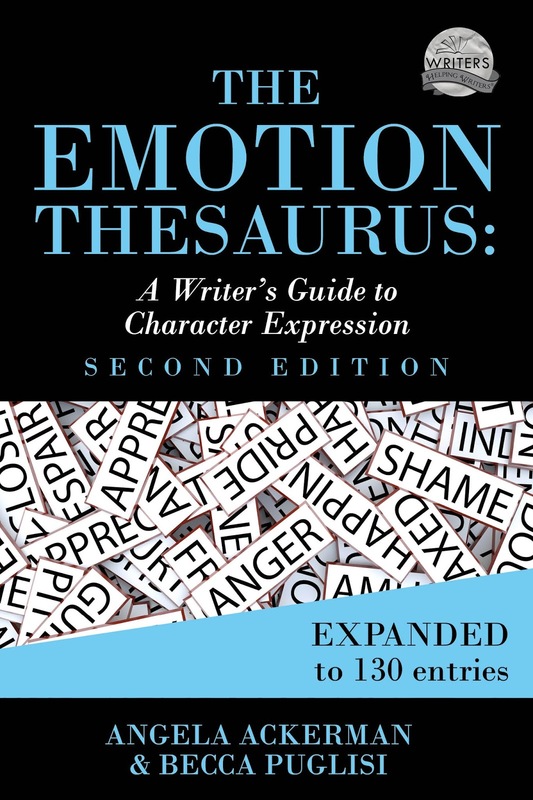 And if you happen to be a fan of our work, you might be interested to know there is now a Second Edition of The Emotion Thesaurus. We’ve added 55 new emotions to the original 75 and have made a lot of other improvements. We also have a free webinar on Using Emotion to Wow Readers that we’ve made available until the end of February. If this is an area of struggle, visit this post to grab the link! 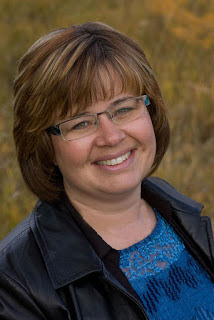 Angela Ackerman is a writing coach, international speaker, and co-author of the bestselling book, The Emotion Thesaurus: A Writer’s Guide to Character Expression, (now an expanded 2nd edition!) as well as six others. Her books are available in six languages, are sourced by US universities, and are used by novelists, screenwriters, editors, and psychologists around the world. Angela is also the co-founder of the popular site Writers Helping Writers, as well as One Stop for Writers, an innovative online library built to help writers elevate their storytelling. Find her on Facebook, Twitter, and Instagram. I'm a very big fan of using settings to mirror story events. I like the setting to have the importance of a major character. I also want the setting to be so important to the story that the story could not happen in a different setting. As a marketing person I want the setting to be interesting to a great number of people. Imagine a suspense story taking place inside Disney World and the killer may be an employee. You can go back stage and fascinate a lot of readers as they enjoy the narrative. I consider doing this as providing 'added value' to the story as a bonus. I like for the reader to feel like she has learned some useful and interesting things along with being entertained by the story. I'm now watching many different BBC mystery shows on DVD and it is amazing how many scenes are chosen for their high interest or exceptional beauty. Scenes that could happen anywhere are in historic locations or in beautiful gardens or at great mansions. How a person sees the environment can also act as a proxy for the person's inner state. Going into the courthouse the hero sees the litter on the grass, the loose bricks, and dead trees near the park but coming out of the courthouse, after winning his case, he sees the attractive flowering bushes and the happy young lovers having a picnic near the Gazebo. In effect, the setting, as seen by the character, is mirroring the character's emotional state without the writer having to 'tell' the reader. Hopefully the reader can feel the character's inner state without the writer mentioning it. I so welcome your post and would love to hear more. Vince, I agree. I especially like to look at what my character is going to notice in a scene depending on their emotions at the time. We can really play with that to highlight the emotion! Vince, I could not have said it better myself. Setting is a storehouse of emotional power but many writers don't use it to its full extent, often because they are afraid of the setting description overwhelming the action or because they go with the first idea that comes to mind, which can often be something they themselves have had a lot of exposure to - a setting often used in books, movies, or something that happens to be in close proximity to the character's location (and therefore "easy"). Thinking about what is meaningful to the characters, what will provide a fresh experience for readers, and what settings and symbolism can be incorporated to mirror emotions, desires, needs, wounds, and more...this is what leads to powerful scenes. When description does double or triple duty (characterizing, showing emotions, supplying mood, hinting at past trauma, mirroring desires or needs, etc.) it earns its place in the story and doesn't slow the action. It enhances it, layering it with deeper meaning. But empty description details of the setting...these should be minimized. Not every setting needs to be deeply symbolic and meaningful, but most should be, adding to the story in some way other than to describe where the character happen to be. You've hit so many more good points about the use of setting that it made me visualize setting as being another dimension available to the writer. Think of writing as two-dimensional when the setting is treated as wallpaper. Now think of writing as fully three-dimensional when the setting is fleshed-out and exploited to a purpose with regard to the many unique functions setting can perform. I've always felt that your writing reveals a love for your readers like no other author I've read. I'm not sure how you do this but it may have something to due with making the reader feel what the characters are feeling. I'd just love to see more production from your pen. Yes, exactly. We explore a lot about how setting can be used in the Urban and Rural Thesaurus books. If you go to Amazon's "look inside" a lot of the teaching content surrounding this is visible. Hullo Vince, what a brilliant way of SHOWING!!! I hadn't thought of it that way, but don't we do that in real life? When we're upset or angry, we see the ugly; and when we're on top of the world, we see the beauty! And Angela, always a wonderful post! I'm also an actress and I emergy myself in a scene - and this parlays very well to my writing! Angela, thank you for this wonderful post. You've touched on so many important things for us to focus on as writers, all things that will increase the credibility of the story and the reader's enjoyment. And I needed this reminder! So glad you're here today! I BROUGHT COFFEE!!!! AND HOT CHOCOLATE. NO STINKIN' POLAR VORTEX IS GOING TO MESS WITH US! Ruthy, stay warm!!! It's 20 degrees here right now. Pretty cold for us! What's the temp there? How much snow do you have? Oh my gosh, the weather has been so weird this year. Lucky for me because it has meant unseasonably warm temps! Experience existence on a higher plain. Angela, welcome back! Thank you for this great post! I love your example of choosing settings where there are a lot of negative emotions to push the character to face his/her problems. (ie. the drive to the airport or the playground where his mom used to take him.) Such a great reminder to use this as writers! Happy to be here, Missy! Putting just a bit of extra thought in where an important story moment should take place always pays off! Lee-Ann, I have several of their books and use them regularly! They're excellent writer helps! Hey, everyone, please check in and let us know how your weather is! I hope you're staying safe and warm! It's horrible here. I'm getting a lot done, writing and even housework, because I HARDLY EVER LEAVE THE HOUSE. Goodness, Kathy!! I'm sorry you're snowed in. At least you're getting some writing time! But I hope you have enough food, etc. Missy, here in south central Nebraska it isn't as bad as some areas--only single digit wind chills as opposed to double digits in other parts of the state and neighboring states. Still, I am only getting out when I have to go to work later this afternoon. Planned for it. Cooked a turkey AND a ham, so we have stuff to nosh on, and laid in a supply of flour, sugar and chocolate so I can bake. Going out to shovel in a little while, whoop te doo. Angela, this is so deep and so true. Setting and emotion should go hand-in-hand and often do, everything from "I'm going back to Tara" to today's Hallmark movies, which inevitably have someone ambitious stuck in a small town. It's even more crucial if it's THEIR small town, and the past is there to greet them. The ugly-duckling-turned-swan at her high school reunion is one example, although vastly overused. My contracted book, an Oregon Trail romance being published by Pelican this September, uses this technique, at least I hope. Not only is heroine Caroline reunited with Michael, the man who betrayed her, but they meet again on the OREGON TRAIL. "Michael had once betrayed Caroline's trust, in the worst possible way. Can she trust him to get her to the Oregon Country, and can he trust God and himself for forgiveness?" The rigors of the trail bring out their past relationship and force them to confront their issues. I've also done it with my New York 1920s series, still un-contracted, where a gently-bred young woman takes a job as a nurse in a Hell's Kitchen settlement house. "Violet O'Connell found everything she needed among people who had lost everything." The hero doesn't think she can handle Hell's Kitchen, so there's the conflict. And my current contemporary, a "coming home/small town" romance, uses this blend too. Jane has built a life away from Hilltop, New Hampshire, but when she has to come home for an extended period of time she finds it all unraveling, due to a dying Prodigal Mother and a handsome pastor bound and determined to see her in the Kingdom. I also love it when other writers mix setting and emotion, like Lauraine Snelling's Dakota series (Ingeborg wouldn't HAVE a story if it wasn't for the prairie) and Melody Carlson's River trilogy. I love it when the setting is so strong it functions as a character. Great examples, Kathy! Your stories sound fantastic! I have been blessed because I usually "get" my main characters AND setting at roughly the same time. Bracing for the day when I have a setting and have to pray my characters into it, or characters show up and I need to find a setting. But so far, WHERE they are seems to have been the logical consequence of WHO they are. I do layer in stuff as I go along, but the basics seem to show up at the same time. Don't ask me why, maybe God thought I had enough of a learning curve without that. I think the more we understand about craft and strong writing the more our gut instinct guides us as well. A lot of the time I will do something and not know the rule behind it, just know it feels right, and then down the road I read something that digs into the "why" of a writing rule and I discover why I do what I do, lol. Yeah, I think y'all are right. I believe we absorb a LOT by being avid readers. You've brought out a point that I hadn't considered before - choosing the setting to reveal the emotions of the character. I often choose my settings to heighten external conflict, but I hadn't thought of consciously choosing them to bring out the internal conflict. I also write with The Emotion Thesaurus by my side. I'll have to get the new edition! Jan, I just pre-ordered my copy today! It's been a huge help to me as well. I did get my pre-order bonus! And already read it. :) Thanks! Thank you so much for this inspiration! I personally struggle with setting, because I couldn't care less where the story takes place, as long as I can relate to deep, complex characters. Thank you for showing how I can use settings to delve into a backstory and show vulnerability! Oh, and I forgot to say that I downloaded a free sample of the Emotion Thesaurus and loved it! Lila, I tend to relate more just to the characters, however it's striking to me to realize how much setting can play a part when I really delve into how authors have used their setting. I think with many story elements, we tend to think of them as separate entities: Setting, Character, Plot, Symbolism, etc. But the truth is they are all connected. When we weave them together with purpose (using emotion), that's when magic happens. Great post, Angela. I am going to watch that webinar. I think it will be helpful. I have finished writing my first book, which is about a Nebraska town devastated by a tornado. So setting is key in this story but I think I could do much more based on what you have shared. I need to go back to revise so will keep these points in mind. Sandy, congrats on typing The End! Yes, definitely setting will have a big part in the story—good luck! 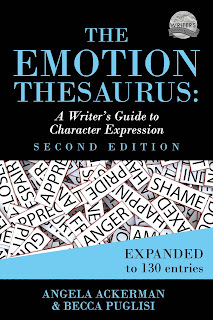 I have the first edition of the emotional thesaurus and I'm now wondering about your unusual pre-offer bonus of a PDF of the emotions that were written for the new edition but not used. How many are there and why were they left out? This makes me think that the omitted emotions are the most interesting and esoteric of the bunch. I just wonder about how many emotions on this list are ones that I never heard about. And if I never heard of a given emotion how will I be able to come up with a physical proxy for that emotion? I just love physical proxies. I don't know where you live, but some Amazons have are books available to preorder, and some only have the kindle version. If you visit an Amazon and it says it isn't available yet but the cover is there, you will see a button where Amazon will email you when it's available. This is what I had to do for Amazon.CA because the print isn't up yet. Vince, you should be able to click the links above and get to Angela's site where there are links to all booksellers. I used the link on your webpage, got to the Amazon page for the pre-order, ordered a copy, and mailed a screen capture to you at the address given in the code for mailto. I hope it works. As for the extra emotions, I thought there might have been 30 or more. Given what you wrote it now all makes sense. Looking forward to the new expanded edition. Thanks for your post today. I've already received the bonus pages! Great service. Very detailed. I see what you mean by there being other emotions which might overlap in some degree with other emotions in past editions. But the world is like that. Almost every discipline, science, or endeavor will overlap with some others. In fact, seeing the overlapped when compared to the non-overlapped is in itself interesting in how the two emotions compare. Much progress in philosophy has been made by 'contrast and compare'. Thanks, Vince! I hope you find the book super helpful! I have the first book, but it looks like I need to get the second one. I'm definitely adding it to my wish list. It's funny, I am such a but proponent of description, but my first drafts are always lean. I find I have to go back and layer in the detail in the second draft. My first drafts lack description, too. My critique partner always has to tell me to set the scene. She can't figure out where it's taking place and can't envision it at all! I'm a big fan of making the setting almost a character in itself. This is a "keeper" post, so thank you, Angela! I'll have to invest in this second edition. Yes, me too! Very glad you liked the post! Laurie, your setting is definitely important in your book! Welcome, Angela! I LOVE The Emotion Thesaurus. When I'm stuck for a gesture, expression, or mannerism, I can always find something useful in the thesaurus to help! I enjoyed this post Angela. I found it very useful. I haven't taken advantage of your products, (in non-writing phase presently) but hope to do so in the future. Meanwhile, I will absorb and learn. Thanks for sharing!! Deb, we're glad to see you today! Deb, so glad you enjoyed this post. I hope you are refilling the creative well! Angela, this was a great article. I'd love to get a copy of your thesaurus. Angela, we're glad you stopped by! Caryl, thanks for stopping by! Angela, I've heard so much about you from writer friends. Your post has exceeded my expectations. Going to check out the webinar too. Thanks! Cathy, it's great to see you! I, too, really loved this post. Wow, there’s so much for authors to think about when writing. Your insightful article just reminds me more of why I am a reader and not a writer! I use a thesaurus frequently when writing reviews so know how valuable your emotion thesaurus must be to authors. Thx for sharing today. Anne, you're right about how it's similar to a reviewer using a thesaurus! It can really help. The thing I love about writing is how we never stop learning. Around every corner is a new epiphany! Your book has been in my cart at Amazon for way too long.. but now I'm kind of glad I procrastinated, so I can pick up the new edition. Thanks for a great post! Glynis, I'm sure you'll love it! Angela, I loved this post. Remembering to let our characters experience those uncomfortable emotions is good too. Your suggestions for using setting to amplify their emotions is good. I still struggle with this, and I appreciate your suggestions! I'm going to check out your webinar now. Thanks for sharing it! Jeanne, I'm glad you found it helpful, too! I am glad this helped and sparked some new ideas. Enjoy the webinar! Thanks for sharing this post and the link to your webinar. Connie, thanks for stopping by! I hope you get a chance to watch it!